9-11 Commission Records - The National Commission on Terrorist Attacks Upon the United States, known as the 9/11 Commission, was an independent, bipartisan commission created by Congress. The Commission's mandate was to provide a "full and complete accounting" of the attacks of September 11, 2001 and to provide recommendations as to how to prevent such attacks in the future. The Commission, extant from 2003 - 2004, held hearings, conducted interviews, and produced a report. When the 9/11 Commission closed on August 21, 2004, it transferred legal custody of its records to the National Archives and Records Administration (NARA). The Commission encouraged the release of its records to the fullest extent possible in January 2009. Because the Commission was part of the legislative branch its records are not subject to the Freedom of Information Act (FOIA). Approximately 35% of the Commission's archived textual records are now publicly available. 9-11 Inquiry - Event held in San Francisco March 26-28, 2004 to provide a meeting place for 9-11 witnesses, testimony, researchers, filmmakers, and evidence seekers. 9-11 Press for Truth - Adapting Paul Thompson's definitive Complete 9/11 Timeline (published by HarperCollins as 'The Terror Timeline'), the filmmakers collaborate with documentary veterans Globalvision ('WMD: Weapons of Mass Deception', 'Beyond JFK') to stitch together rare overlooked news clips, buried stories, and government press conferences, revealing a pattern of official lies, deception and spin. As a result, a very different picture of 9/11 emerges, one that raises new and more pressing questions. 9-11 Records - From the New York Times, a rich vein of city records from Sept. 11, including more than 12,000 pages of oral histories rendered in the voices of 503 firefighters, paramedics, and emergency medical technicians, were made public on Aug. 12. The New York Times has published all of them. 9-11 Research - Testing the central assumptions of government bodies and officials. 9-11 Review: Expose the Deception - Despite two years of repeated attempts by the families of the victims of 9/11, there has never been an independent investigation of what really happened that day. Is there an ongoing coverup? Both President Bush and Vice-President Cheney took extraordinary steps to limit any investigation into the events of 9/11. The NTSB never held inquiries into any of the 4 plane crashes, as required by law, and the FBI is withholding the data from the airliner's flight recorders. All of the steel from the Twin Towers was shipped out of the country before any investigation was held. 9-11: What Really Happened - Compilation of links charging U.S. government complicity in 9-11. 9-11 Report Raises More Serious Questions About The White House Statements On Intelligence by John Dean - 29 Jul 03: "Bluntly stated, either the Bush White House knew about the potential of terrorists flying airplanes into skyscrapers (notwithstanding their claims to the contrary), or the CIA failed to give the White House this essential information, which it possessed and provided to others." 9-11 Review - Collection of works on the 911 attacks from independent investigators and analysts. Overviews of the 911 investigation, both official and unofficial. American Scholars Symposium - In June 2006 researchers, scholars, journalists, media personalites, and average folks came together from all over the USA to gather in Los Angeles to invite the rest of the world to examine the facts of 9/11. Through presentations from prominent guest speakers and documentary screenings the Neo-Con Agenda and 9/11 were examined as the pretext for the brutal on-going war in Iraq as well as the establishment's future plans. Clearing the Skies - In this two-part series, USA TODAY reconstructs how the unprecedented order to clear the skies on Sept. 11 played out. Collapse, The: An Engineer's Perspective by Dr. Thomas Eager - NOVA interview with Thomas Eager, a professor of materials engineering and engineering systems at the Massachusetts Institute of Technology who went on to write an influential paper in the journal of the Minerals, Metals, and Materials Society entitled Why Did the World Trade Center Collapse? Science, Engineering, and Speculation (JOM, December 2001). Complete 9/11 Timeline - By Paul Thompson, Center for Cooperative Research. Consensus 9/11 - The 24-member 9/11 Consensus Panel is building a body of evidence-based research into the events of September 11, 2001. This evidence -- derived from a standard scientific reviewing process -- is available to any investigation that may be undertaken by the public, the media, academia, or any other investigative body or institution. The Panel regularly features selected excerpts from its Consensus Points, with links to full supporting documentation. These featured excerpts are shown below, along with other recent news items. Deal on 9/11 Briefings Lets White House Edit Papers by Philip Shenon - The 9/11 Commission accepted a deal with the White House under which access to highly classified Oval Office intelligence reports would be restricted to just a few members of the commission, who would be allowed only to take notes of edited reports. Additionally, these notes would have to be shown to the White House. - The New York Times, 14 Nov 03. Declassified Documents Relating to the 9/11 Attacks - Provided by the CIA. Engineering Ground Zero - Special PBS NOVA report follows a team of forensic engineers during their investigation of the causes of the Twin Towers' collapse. FBI and 9/11 by Sibel Edmonds - Over four years ago, more than four months prior to the September 11 terrorist attacks, in April 2001, a long-term FBI informant/asset who had been providing the bureau with information since 1990, provided two FBI agents and a translator with specific information regarding a terrorist attack being planned by Osama Bin Laden. Great Deception, The: What Really Happened on Sept. 11, 2001 - From VisionTV's Insight Mediafile, hosted by Barrie Zwicker. How Strong Is the Evidence for a Controlled Demolition? - "Given the scale of the disaster, the loss of life and the unique nature of the collapses, we would expect the most scrupulous possible treatment of the physical evidence from the collapse site to allow for future scientific analysis. What happened instead was an unexplained decision by the city of New York to remove and recycle as much as possible of the structural steel as quickly as possible, scrubbing the crime scene of the great majority of the physical evidence. The destruction of the World Trade Center has never been subjected to the scrutiny it deserves as a crime and as an unprecedented engineering failure, and an enormous amount of information crucial to a proper investigation has been irrevocably lost. How is it possible that this uniquely horrific event has been subjected to so little rigorous investigation or forensic engineering analysis? And what possible innocent motivation could there be for the great haste with which so much irreplaceable physical evidence was destroyed? There are quite a few still pictures showing what can only be described as explosive ejections of material from the towers, pulverized concrete and shattered pieces of the steel perimeter columns thrown out even in the early stages of the collapses." It's About Oil by Ted Rall - "As Central Asian expert Ahmed Rashid describes in his book Taliban, the United States and Pakistan decided to install a stable regime in place in Afghanistan around 1994 - a regime that would end the country's civil war and thus ensure the safety of the Unocal pipeline project. Impressed by the ruthlessness and willingness of the then-emerging Taliban to cut a pipeline deal, the State Department and Pakistan's Inter- Services Intelligence agency agreed to funnel arms and funding to the Taliban in their war against the ethnically Tajik Northern Alliance. As recently as 1999, U.S. taxpayers paid the entire annual salary of every single Taliban government official, all in the hopes of returning to the days of dollar-a- gallon gas. Predictably, the Taliban "Frankenstein" got out of control. The regime's unholy alliance with Osama bin Laden's al Qaeda terrorist network, their penchant for invading their neighbors and their production of 50 percent of the world's opium made them unlikely partners for the desired oil deal. Journal of 9/11 Studies - A peer-reviewed, open-access, electronic-only journal covering the whole of research related to 9/11/2001. Man Who Knew, The - When the Twin Towers fell on Sept. 11, 2001, among the thousands killed was the one man who may have known more about Osama bin Laden and Al Qaeda than any other person in America: John O'Neill. The former head of the FBI's flagship antiterrorism unit in New York City, O'Neill had investigated the bombings of the U.S. embassies in Africa and the USS Cole in Yemen. This Frontline documentary chronicles O'Niell's story. Minute by Minute with the Broadcast News by Jill Geisler (09/02/2002) - Posted to Poynter on September 11, 2001. New Seismic Data Refutes Official WTC Explanation - By Christopher Bollyn, 09 May 02. Also see the Columbia University World Trade Center Disaster Seismic Data. National Commission on Terrorist Attacks Upon the United States - Also known as the 9-11 Commission, an independent, bipartisan commission created by congressional legislation and the signature of President George W. Bush in late 2002, is chartered to prepare a full and complete account of the circumstances surrounding the September 11, 2001 terrorist attacks, including preparedness for and the immediate response to the attacks. The Commission is also mandated to provide recommendations designed to guard against future attacks. On July 22, 2004 the Commission released its public report, which is available for download from this site. The report is also available in bookstores nationwide and from the Government Printing Office. On August 21, 2004 the Commission released two staff monographs, available for download along with other staff statements on this site. The Commission closed on August 21, 2004. No Urgency - Article by George Szamuely published by the New York Press on 15 Feb 02 commenting on the curious lack of military action on the morning of Sept. 11, 2001. 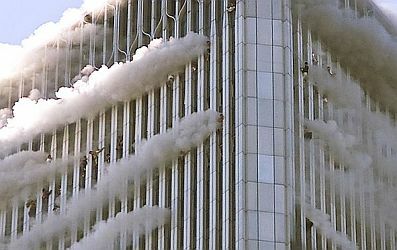 North Tower's Dust Cloud, The by Jim Hoffman (16 Oct 03) - On September 11th, Both of the Twin Towers disintegrated into vast clouds of concrete and other materials, which blanketed Lower Manhattan. This paper shows that the energy required to produce the expansion of the dust cloud observed immediately following the collapse of 1 World Trade Center (the North Tower) was much greater than the gravitational energy available from its elevated mass. It uses only basic physics. "Oh Lucy! - You Gotta Lotta 'Splainin To Do" - A timeline surrounding September 11. If the CIA and the government weren't involved in the September 11 attacks, what were they doing? - by Michael C. Ruppert. Oral Histories From Sept. 11 - Compiled by the New York Fire Department and publichseed by The New York Times. Pentagon Attack Footage - As of May, 2006, the only video footage of the crash that has been released are clips from two Pentagon security cameras north of the crash site, one the source of 5 frames leaked in 2002. Peter Lance - Investigative reporter, novelist, screenwriter. Peter Lance authored 1000 Years For Revenge: International Terrorism and the FBI - The Untold Story. Physics of the 2001 World Trade Center Terrorism - This article argues that the World Trade Towers initially withstood the impact of the Boeing 767 jets, which they were designed to do, but the subsequent fire generated by burning jet fuel melted steel eventually causing an implosion in which upper level floors fell upon lower level floors to create a complete collapse, like a toppling row of dominoes. Prepared by the staff of Jupiter Scientific. Role of Pakistan's Military Intelligence Agency (ISI) in the September 11 Attacks by Michel Chossudovsky - Posted to the Centre for Research on Globalisation on 02 Nov 01. $elling Out the Investigation by Bill Manning - Fire Engineering's editor in chief Bill Manning's call for a "full-throttle, fully resourced" investigation into the collapse of the World Trade Center. September 11: Unanswered Questions - Examination of facts surrounding 9-11 event and aftermath. So-Called Evidence Is a Farce by Stan Goff - First published at Narco News Commentary on 12 Dec 02. Special Coverage: Terrorism - U.S. civil and criminal terror cases from FindLaw. Split-Second Error, The: Exposing the WTC Bomb Plot - Argues that the wrong tower fell first, that the buildings fell in a controlled demolition. Suppressed Details of Criminal Insider Trading Lead Directly into the CIA's Highest Ranks by Michael C. Ruppert - Published 09 Oct 01: "There is abundant and clear evidence that a number of transactions in financial markets indicated specific (criminal) foreknowledge of the September 11 attacks on the World Trade Center and the Pentagon. That evidence also demonstrates that, in the case of at least one of these trades - which has left a $2.5 million prize unclaimed - the firm used to place the "put options" on United Airlines stock was, until 1998, managed by the man who is now in the number three Executive Director position at the Central Intelligence Agency. Timeline of Competition Between Unocal and Bridas for the Afghanistan Pipeline - Principal players were Unocal (now merged with Chevron) and Bridas, now merged with BP Amoco Argentina. Was 9/11 Allowed to Happen? - Summary of 9/11 timeline developed by Paul Thompson. WhatReallyHappened - This website is non-partisan, anti-war, and anti-lie. The purpose of this site is to expose deceptions by governments and media used to trick the public into wars and out of their money. Why Did the World Trade Center Collapse? by Thomas Eager - Science, engineering and speculation. Why Don't We Have Answers to These 9/11 Questions by William Bunch - Philadelphia Daily News article, 11 Sep 03. World Trade Center - Information on the WTC including architect, location, construction system, building images, Manahattan overviews, drawings and floor plans, 3D model and more at the Great Buildings Collection site. World Trade Center Collapse: Soome Engineering Aspects - Engineering aspects, images, and resources from the Department of Civil Engineering, The University of Sydney. World Trade Center Demolition and the So-Called War on Terrorism - Argues that the official story of what happened on September 11th, 2001, is a fabrication. Provides theories for explosives in the Twin Towers, remote-control of the jet liners, missle attack on the Pentagon, and other theories. World Trade Centre New York - Some Engineering Aspects - From the Department of Engineering at the University of Sydney. 9-11 Commission - Also known as the Kean Commission and the National Commission on Terrrorist Attacks Upon the United States. An "independent", bipartisan commission created by congressional legislation and the signature of President George W. Bush in late 2002, chartered to prepare a complete account of the circumstances surrounding the September 11, 2001 terrorist attacks, including preparedness for and the immediate response to the attacks, and to provide recommendations designed to guard against future attacks. See the final 9/11 Commission Report (.pdf, 585 pp.) released 22 July 2004. 9/11 Commission Recommendations: A Civil Liberties Oversight Board (.pdf, 5 pp.) - A CRS report to Congress, 09 Aug 04. 9/11 Commission Recommendations: Joint Committee on Atomic Energy - A Model for Congressional Oversight? (.pdf, 38 pp.) - A CRS report to Congress, 20 Aug 04. 10 Downing Street - UK news and information. Aeronautical Information Manual (FAA) - Official guide to basic flight information and Air Traffic Control (ATC) procedures. Aviation Security-Related Findings and Recommendations of the 9/11 Commission (.pdf, 13 pp.) - A CRS report to Congress, 24 Aug 04. Border Patrol (U.S.) - Official page. Bureau of Alcohol, Tobacco and Firearms - Official page. Center for Disease Control and Prevention (CDC) - Official page. Citizenship and Immigration Services (USCIS) - Official page. Coast Guard (USCG) - Official page. Customs Service (U.S. Customs and Border Protection) - Official page. DefenseLINK - U.S. Department of Defense: DoD News, DoD Sites, and American Forces News. Department of Justice - Official page. Executive Office of the President of the U.S. (EOP) - White House offices and agencies. Federal Aviation Administration (FAA) - Responsible for the safety of civil aviation in the U.S.
FBI Internet Fraud Complaint Center (FBI-IFCC) - Report terrorist activity. FBI Press Room - FBI press releases. Financial Action Task Force (FATF) - Governmental body whose purpose is the development and promotion of policies, both at national and international levels, to combat money laundering and terrorist financing. Foreign Intelligence Surveillance Act (FISA) FAQ - FISA establishes a legal regime for "foreign intelligence" surveillance separate from ordinary law enforcement surveillance. Also see Surveillance Under the Foreign Intelligence Surveillance Act (FISA). National Archives and Records Administration (NARA) - Whose mission it is "to ensure ready access to essential evidence that documents the rights of American citizens, the actions of federal officials, and the national experience." Visit NARA's Charters of Freedom Exhibit to refresh your memory of the Declaration of Independence, Constitution of the United States, and the Bill of Rights. National Commission on Terrorist Attacks Upon the United States (9-11 Commission/Kean Commission) - An "independent", bipartisan commission created by congressional legislation and the signature of President George W. Bush in late 2002, is chartered to prepare a complete account of the circumstances surrounding the September 11, 2001 terrorist attacks, including preparedness for and the immediate response to the attacks. The Commission is further mandated to provide recommendations designed to guard against future attacks. National Transportation Safety Board (NTSB) - Investigates every civil aviation accident in the U.S.
NATO News - Official North Atlantic Treaty Organization (NATO) news. NIST WTC 7 Investigation Finds Building Fires Caused Collapse - "Our study found that the fires in WTC 7, which were uncontrolled but otherwise similar to fires experienced in other tall buildings, caused an extraordinary event," said NIST WTC Lead Investigator Shyam Sunder.Heating of floor beams and girders caused a critical support column to fail, initiating a fire-induced progressive collapse that brought the building down." "Video and photographic evidence combined with detailed computer simulations show that neither explosives nor fuel oil fires played a role in the collapse of WTC 7," Sunder said. The NIST investigation team also determined that other elements of the building's construction-namely trusses, girders and cantilever overhangs that were used to transfer loads from the building superstructure to the columns of the electric substation (over which WTC 7 was constructed) and foundation below-did not play a significant role in the collapse. According to the report, a key factor leading to the eventual collapse of WTC 7 was thermal expansion of long-span floor systems at temperatures "hundreds of degrees below those typically considered in current practice for fire resistance ratings.WTC 7 used a structural system design in widespread use. Quadrennial Defense Review Report (09/30/01) - Department of Defense strategic planning document. Recommendations from the 9/11 Commission Report - 41 major recommendations outlined. Full report also provided. From Now with Bill Moyers. Response to 9/11 (EPA) - To protect public safety and health, EPA coordinated with multiple levels and branches of government to respond comprehensively to the initial emergency situation and the resulting environmental disaster. Secret Service - Official page. Secretary-General's Latest Statements - United Nation's site for official statements. Secretary of State Press Relations Office - Official statements, remarks by the Secretary, briefings by the Spokesman. Secretary of State Transcripts - All speeches, testimony, briefings, statements, and other remarks from the Secretary of State. Twenty-one 9-11 Recordings from North American Aerospace Defense Command and United States Northern Command (NORAD-USNORTHCOM) - This file contains: governmentattic.org cover sheet, list of files with hyperlinks to the actual mp3 audio files, and the NORAD/USNORTHCOM release letter. This material totals over 100 hours of audio recordings of various NORAD/NORTHCOM communications channels on September 11, 2001 in 21 separate mp3 audio files. World Trade Center Building Performance Study (FEMA) - Following the September 11, 2001, attacks on New York City's World Trade Center (WTC), the Federal Emergency Management Agency (FEMA) and the Structural Engineering Institute of the American Society of Civil Engineers (SEI/ASCE), in association with New York City and Several other Federal agencies and professional organizations, deployed a team of civil, structural, and fire protection engineers to study the performance of buildings at the WTC site. World Trade Center Health Registry - A comprehensive and confidential health survey of those most directly exposed to the events of 9/11/01. Those who enrolled answered a 30-minute telephone survey about where they were on 9/11/01, and were asked to report the status of their health. This will allow health professionals to compare the health of those most exposed to the events of 9/11/01 with the health of the general population. 9-11 Blogger - Alternative 9/11 related news. 9-11 Deception Dollar - Committed to exposing the truth about 9-11 and the "war on terrorism ". Also see links for more sites investigating 9-11. 9-11 Family Steering Committee for the Independent Commission - The Family Steering Committee's goal is to monitor the progress of the 9-11 Commission to ensure that it assiduously follows its mandate for a broad, in depth investigation. 9-11 Research - We all know the official story of September 11th: four jetliners were hijacked by groups of four and five Arabic men armed with box cutters, who proceeded to fly three of the four jets into the Twin Towers and the Pentagon. Subsequently the World Trade Center Towers, weakened by the impacts and fires, collapsed into piles of rubble. Later in the afternoon 47-story Building 7, also weakened by fire, collapsed (a fact that most people remain unaware of). The FBI had compiled a list of hijackers within three days, and it was so obvious that Osama bin Laden had masterminded the operation from caves in Afghanistan, that there was no need to seriously investigate the crime or produce evidence. The "retaliatory" attack on the Taliban would soon commence. Is this story true? Its central assumptions have never been tested by an official government body whose members lack obvious conflicts of interest. There are numerous red flags in the official story, which requires a long series of highly improbable coincidences. Questioning that story is an act of responsible citizenship. 9-11 Truth - Review articles, books, videos, sites and other resources published and linked at the site. Campaigns to educate the public about the Sept. 11th coverup. Provides media, educational and organizing materials; plans actions around key events in the calendar; and invites others to unite in simultaneous actions across the country. 9-11 Visibility Project - Raising public awareness of the disturbing, unanswered questions surrounding the September 11th, 2001, terrorist attacks and drawing attention to the Bush Administration's ongoing efforts to obstruct the current investigation and stonewall the 9-11 National Commission. Best 9/11 Sites - By John Kaminski. BG Truth - 9/11 conspiracy discussion and videos. Family Steering Committee for the 9/11 Independent Commission - Monitoring the progress of the 9-11 Commission to ensure that it assiduously follows its mandate for a broad, in depth investigation. Skyscraper Safety Campaign - A project of the parents and families of firefighters and World Trade Center victims of 9-11. This webpage last updated on Monday, December 19, 2016 2:44 PM.